Apologies for the delay in sending you further news of events across CBA North-land for May and June. As you will see it is something of a bumper issue with many different events coming up soon. Another similarly-sized email is already in preparation with yet more events and announcements to come. Some of these events will bring up-to-date findings from recent research and projects following on from previous emails to you, some deal with new topics different again. For some of these events you will need to book up. As many of you will know the General Data Protection Regulations (GDPR) will take effect soon. We will be emailing everyone on what GDPR means for us to hold and process your information, and more importantly for you to continue to receive CBA North news and information. Further details for these will appear in time on the CBA North website as well to accord with these regulations. However if you you have any immediate questions, please feel free to let us know of them. Once again, if you would like to submit anything on your local group’s recent activities or plans for this summer, please let us know. Keep an eye to our Events page on the website for any additions to the regular talks and lectures of various groups across the CBA North region. Additions to this page are made throughout the year as we know of them. There are a number of events coming up this week. 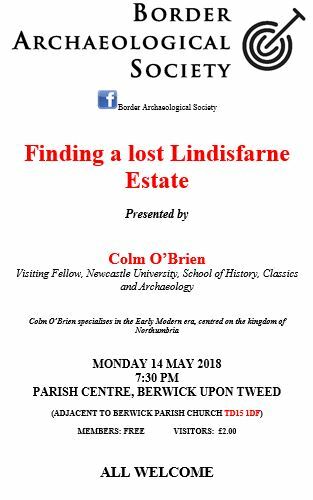 These are located in all parts of our region, they start tomorrow night at Berwick with the next of the Border Archaeological Society’s [BAS] lectures. Josie McChrystal, their Secretary, gives us some more details of what promises to be an interesting talk. “In the early years, the Lindisfarne monastery built up a huge land holding in Northumberland and southern Scotland but in the troubled times of the Viking era some of these lands were taken away from them. Later writers referred to these lands without knowing much about them. We will discover one of these estates in mid-Northumberland on Monday evening. The renowned archaeologist Colm O’Brien will be the speaker on this occasion. He has excavated in Northumberland and taught at the universities of Newcastle and Sunderland. He is especially interested in the Age of Bede and now, in retirement, he co-directs the Bernician Studies Group, a community learning group with projects in Northumberland and in County Donegal in Ireland. As ever, the lecture begins at 7.30 at Berwick Parish Church Hall (Holy Trinity) off The Parade, TD15 1DF. Please tell your family and friends about what promises to be a very interesting evening. All are welcome”. 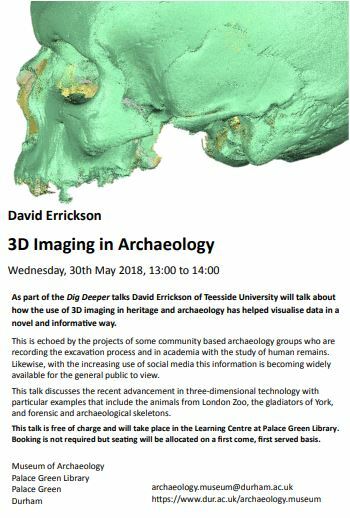 Dave Errickson, Chair of Teesside Archaeological Society [TAS] one of our group members, has let us know of another event. Members will remember our previous note of our Home Front Legacy workshop in 2015 which highlighted ways groups could look out for and record First World War sites. In contrast to Lindisfarne and the north of our region, this concentrates upon these more modern sites in the south of our region and includes work carried out by the TAS group and others on Teesside recording them. All the talks in this free conference relate to the First World War in some way. The conference is in Middlesbrough and on Saturday this week, but you will need to book places for this. They can be obtained from this Eventbrite page here. 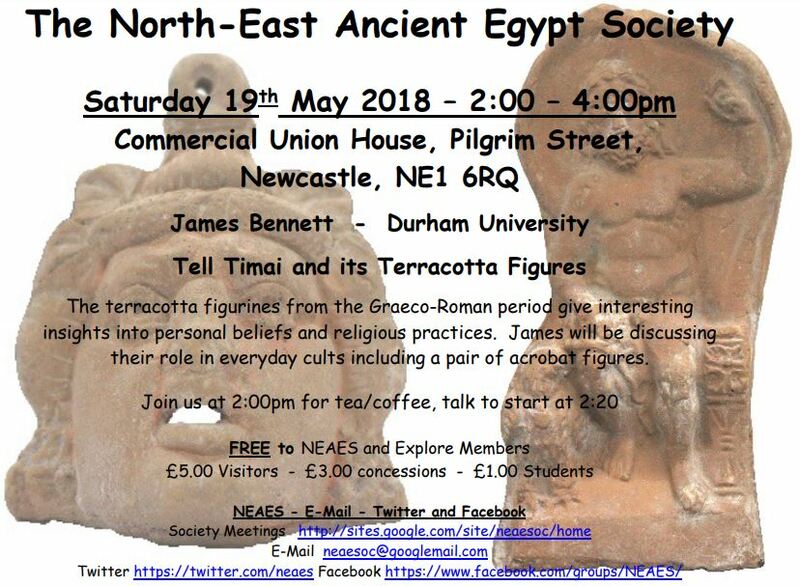 Also on Saturday, but in Newcastle, is also the next lecture of the North East Ancient Egypt Society on something different again. 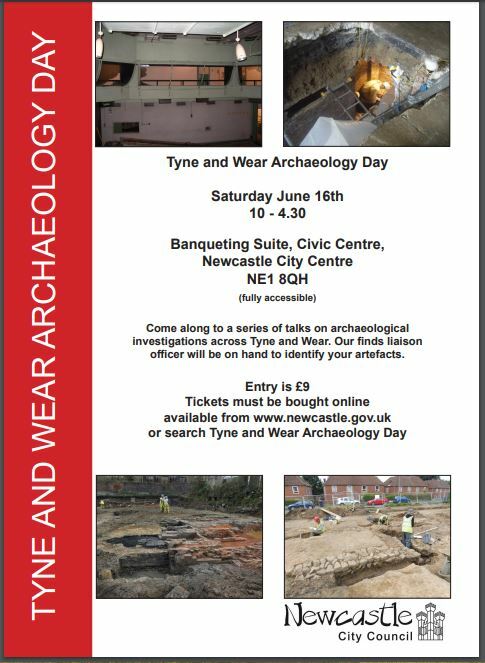 Jennifer Morrison, Tyne and Wear Archaeological Officer, has sent us details of the first Tyne and Wear Archaeology Day which is coming up soon in next month on Saturday, 16 June. To book places details are given in the poster or through clicking the link here. In a fully packed day. Jennifer notes that “Most of the archaeological projects which will be discussed have been funded by developers through the planning process, and the aim of the day is to pass on the results of these exciting excavations to local residents”. Previous CBA North emails have announced talks on forensics and facial reconstruction, as well as osteoarchaeology, for the meetings of various groups. The next Dig Deeper talk at Durham, later this month, will discuss some of the new approaches to looking at and recording old bones – sometimes at a distance to the original samples. Also bone-related our last email carried information about a talk on the Scottish soldiers from the 1650 Battle of Dunbar who had died and been buried at Durham by Richard Annis, once again at Berwick to the Border Archaeological Society in April. Andrew Millard, also of Durham University and involved with the Scottish Soldiers project, has written to us a bit more about the forthcoming exhibition and events associated with that project. “This exhibition shows how the latest scientific techniques have revealed the soldiers’ story – how they lived, why they died, and what became of those who survived. 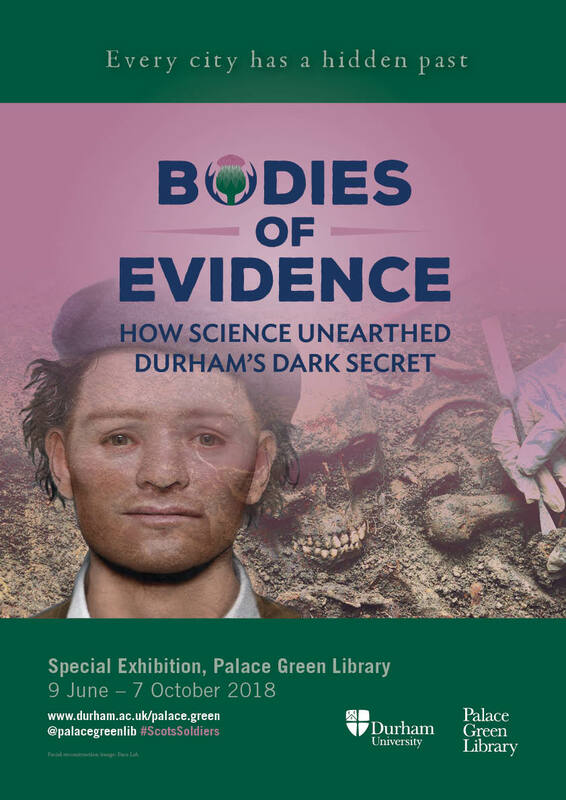 Their skeletons were discovered during excavations in Durham in November 2013 and, for the first time, visitors to Palace Green Library will come face to face with a 3D reconstruction of the face of one of these men in the exhibition. The exhibition also tells the story of those survivors who were transported across the Atlantic to the edge of the known world. These men lived to have families and we are proud to have connected with many descendants, and we hope that descendants will be able to visit us and the exhibition in Durham this summer. Running alongside the exhibition will be a programme of events, including family activities, public lectures, and the new production Woven Bones from Cap-a-Pie theatre company. The play will tell the story of the Scottish soldiers, and will tour venues along the route marched from Dunbar to Durham. Details of the production can be found on the Cap-a-Pie website. The Scottish Soldiers Archaeology Project Team would be delighted to welcome descendants to the exhibition and would be pleased to arrange private tours with members of the Team, so please do let us know if you are planning a visit by emailing Scottish.soldiers@durham.ac.uk. We recognise that Durham is a long way to travel for many of you, and so we are developing a small sister touring exhibition which will visit venues in the United States. More information about this touring exhibition will be made available in due course. Further details and more events will be announced soon. Visit our website to find out more about the exhibition. A book documenting the archaeology of the discovery, the process of analysis, and the history of the Scottish soldiers, including stories of the survivors, has also been produced by the Project Team and will be available in the coming months. Visit Oxbow Books to find out more about the book here. We hope to see you this summer. The Scottish Soldiers Archaeology Project Team & Exhibition Curatorial Team”. This entry was posted in E Newsletter and tagged Ancient Egypt, Archaeology, BAS, Berwick, Early Medieval, exhibitions, fieldwork, forensics, Hadrian's Wall, industrial, Lindisfarne, Modern, museums, NEAES, Northumbria, Prehistoric, Roman, skeleton, TAS, Tyne and Wear, World War 1, World War 2 on May 13, 2018 by cbanorth.